You can never take too many photos! Here is another one of our crafty weekend in Banbury - was that really only three weeks ago ........??? 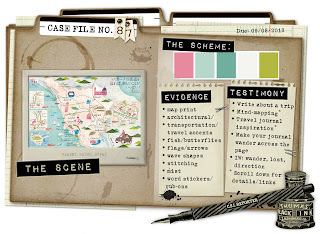 I thought this picture would be ideal for CSI Case File #87 and I've also used a sketch by Paula Ridley for Scrap 365 so I will be linking this up to the September challenge at Sketchbook365 as well. The theme for August over at CSI has been travel and Debbi Tehrani, CSI Mastermind, has come up with yet another interesting Scene to be investigated for Case File #87, the last of this month. 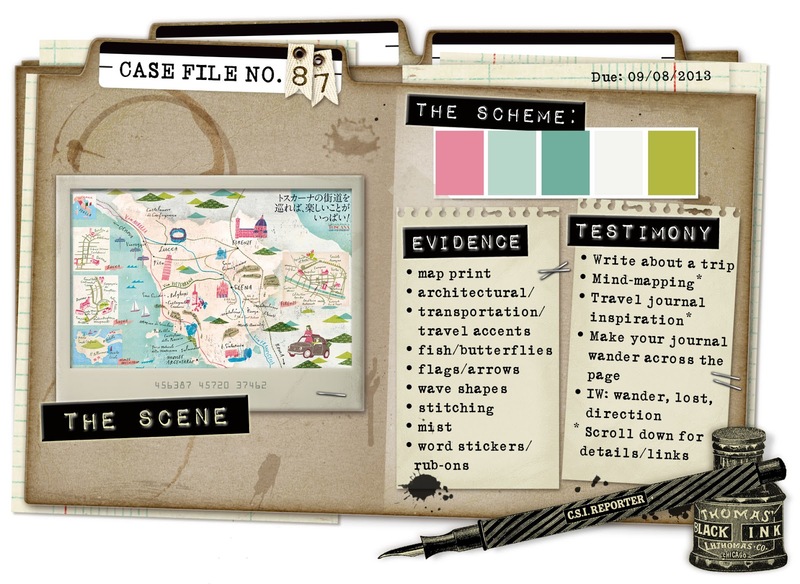 From this inspiration image, Debbi takes the colour combination, ideas for design elements and prompts for journaling. The Evidence: map print,stitching, word stickers, arrows. The Testimony: I've written about a trip, dotted details and story here and there around the page and used the inspiration word "wander". Next to the photo I've written, "Our last day in Oxford. Em, Poll + Chel smiling for my camera, blissfully unaware that we were on borrowed time. This was about 11.30 am ..."
The story continues on the folded tag which is tucked between the layers, "... we had left all our stuff back at our holiday flat, intending to finish all the food, drink + crafting projects that evening, then pack ready for the journey home next day. So we'd left stuff everywhere and gone off for a last wander around Oxford, had a lovely day ... until, at about 4.30, I noticed 10 missed calles on my phone. Turns out we should have left that morning, the cleaner had cleared all our things out + a hew batch of people had already gone in! So, fiver hours after this was taken, these same lovely ladies could be seen running back past this spot, hot and sweaty, heading for the station + trailed by me, adding further drama by having an asthma attack. I had left my inhalers at the flat too! Oh no!! But I was rescued by a kind stranger, we got all our stuff, everyone was so nice about it and we found a room at the Holiday Inn ... Phew!!!" Oh! dear, what a palaver!!! It was awful at the time, but we can laugh about it now - just another holiday story which could have been much worse but for the kindness of strangers. Here is my evidence under the magnifying glass - can you spot all my clues? Thanks for visiting my blog - it's been a bit quiet the last couple of weeks because I can't settle for too long due to back problems - little and not too often seems to be the key. But I'll be fighting (or should that be scrapping?) fit again soon! Congrats Annie, just so your feature at scrap 365!!! !